Meteor: the visible streak of light (popularly called a shooting star or a falling star). The column of light is usually less than 1 meter in diameter but tens of kilometers long. Meteoroid: the solid object that creates the streak. They range in size from large fragments of asteroids or comets to extremely small micrometeoroids. Most visible meteors are created by meteoroids the size of a grain of sand. Meteorite: the surviving object if it reaches the ground. 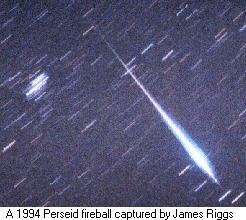 Fireball: a meteor brighter than the evening or morning star, Venus (technically, brighter than magnitude -4). Bolide: a fireball that explodes in a bright flash often with visible fragmentation. Also the generic name for a large crater-forming projectile (comet, asteroid or UFO). Meteor Trail: the trail of ionized dust and gas that remains along the path of a meteor. Meteor Stream: a group of meteoroids in a given orbit as they travel around the sun. These meteoroids are usually the by-product of comets, so it is possible for the parent comet to be traveling in the same orbit--if it still exists. 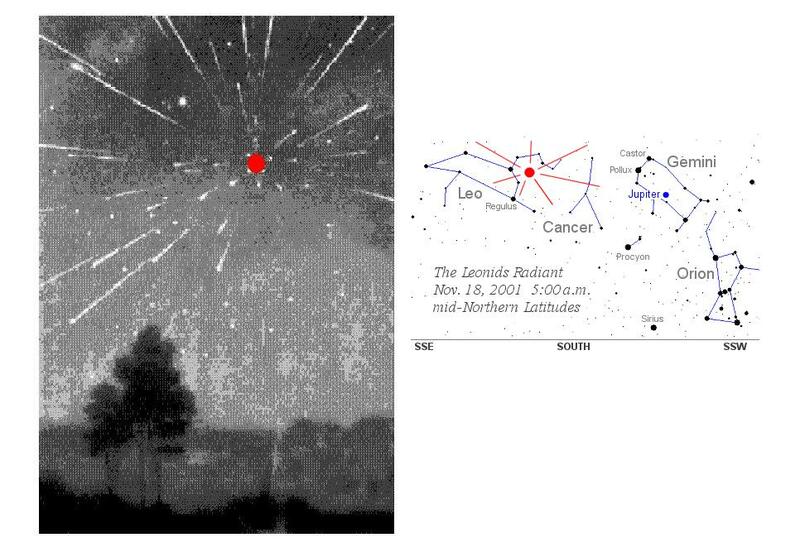 Meteor Shower: the occurrence of meteors as Earth's orbit intersects a meteor stream. The meteors in a shower appear to emanate from a point in the sky known as the radiant. A meteor shower is named after the constellation in which its radiant is located. Meteor Storm: an intense meteor shower that exceeds 1000 meteors per hour which occurs when Earth encounters a dense group of meteoroids within a meteor stream. Minor Meteor Showers: meteor showers that produce less than 10 meteors per hour at the time of maximum activity. Sporadic Meteor: a meteor that occurs randomly, instead of being associated with a meteor shower. There are about 5 per hour in the night sky (peak viewing time is in the autumn before morning twilight). Most meteors occur in the upper mesosphere and lower thermosphere (from about 50 to 75 miles or 80 to 120 km altitude). This is a general guideline only, since very fast meteors may first become visible above this height, and slow, bright meteors may penetrate below this range. Meteors were once thought to be a purely atmospheric phenomena. It was not until the mid-1800's that the extra-terrestrial origin of meteors was widely recognized. The wide range in meteoroid speeds is caused partly by the fact that the Earth itself is traveling at about 67,000 mph (30 km/sec) as it revolves around the sun. On the evening side, or trailing edge of the Earth, meteoroids must catch up to the earth's atmosphere to cause a meteor, and tend to be slow. On the morning side, or leading edge of the earth, meteoroids can collide head-on with the atmosphere and tend to be fast. The Meteor of 1860 inspired poet Walt Whitman as well as the title of a book about the 1860 Presidential election. * The Geminids are known to be of asteroidal (3200 Phaethon) origin rather than of cometary origin.